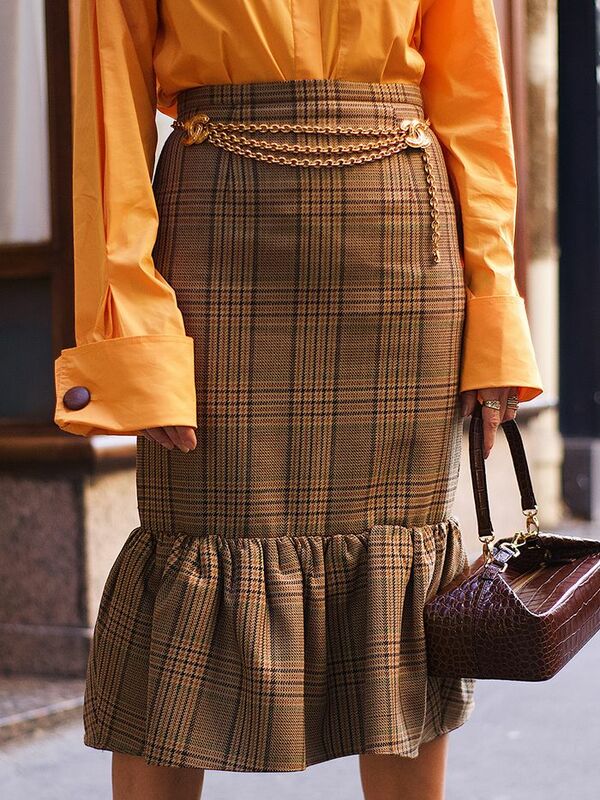 Our favourite part about looking at what fashionable women wore 50, 60 or 70 years ago is not pointing out what’s different about our styles (we’re much more interested in the similarities), but how little has actually changed when it comes to trends. In fact, we’d be willing to bet that a lot of the styles we emulate today were the same ones women in the 1940s wore. The 1940s saw a wealth of iconic looks, including Katharine Hepburn’s penchant for high-waisted trousers and typically menswear-inspired tailored pieces, a well as Dior’s New Look, which came in the later part of the decade but forever remained a fashion reference. And there’s much more beyond that. Keep scrolling to look through to take a look at some of our favourite 1940s fashion moments that speak directly to 2018 women. Style Notes: I don’t know about you, but this buckled dress looks totally like something I’d have bought during summer 2018. Here is Paulette Goddard in 1945 wearing the LWD of our current dreams. Style Notes: Yes, there were “naked” dresses in the ’40s, and they were as glamorous as ever, thanks to the likes of Rita Hayworth wearing them. Style Notes: The ladies of this decade were seriously into puffed sleeves, and now we are too. We’ll happily take this pretty blouse from 1947. Style Notes: Katharine Hepburn’s more androgynous look has provided inspiration for decades after the actress first stepped into the spotlight. Style Notes: Hands up if you bought a red midi dress recently. Same here. Although, we wish we could own this bandana-detailed one worn by Jane Wyman. We love the matching shoes, hair bows and earrings. Style Notes: We’re taking notes on the 1940s way to wear a slip dress—aka with a gauzy, sheer cape top, as seen on Ginger Rogers. Style Notes: Both giant sunhats (think Jacquemus) and clear PVC sandals (think Kim Kardashian West wearing Yeezy) have been trending all summer long. So before you think celebs of today started the look, think again. Style Notes: While a shimmery evening gown is chic in any era, Lena Horne’s coordinating head wrap with sparkles made this ensemble shine even brighter. 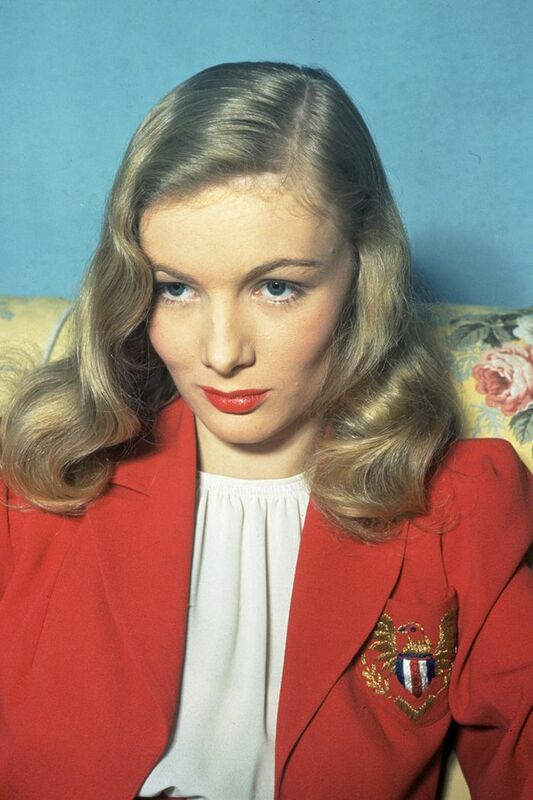 Style Notes: Veronica Lake does a not-so-mellow yellow look we’d happily wear today. It’s so Gen Z. Style Notes: We can appreciate a lady who’s this thoughtful with her belt-and-shoe coordination. Style Notes: Not only do these more demure shapes feel current again, but the super-bright neon shades are going to be big news next year. Mark our words. Style Notes: Thanks to Lauren Bacall, a high neckline, billowy sleeves, wide-leg trousers and mules is still a look we’d go for in 2018. Style Notes: Polka dots come around without fail almost every summer, but they were particularly popular in this smaller print (and especially in red and black) in the 1940s. Style Notes: If the popularity of corset tops are any indication, nipped-in waist styles are still in fashion right now. One of the OG champions of this look was, of course, Christian Dior’s groundbreaking New Look. Style Notes: Ask any fashion editor and they’ll tell you the same thing: White handbags are an excellent investment. HRH Queen Elizabeth agrees. Style Notes: Does this cold-shoulder look resemble your uniform from this past summer? You’re not alone. Style Notes: Before there were irresistible matching sets from Zara and Reformation, the iconic Doris Day looked adorable in coordinating separates right on the cusp of the ’40s and ’50s. Clip-on earrings are so retro yet so current. Wear with a billowing blouse for true Hollywood starlet vibes. A staple for off-duty silver screen goddesses. Best with the matching top, right? Next up, a dive back into '80s fashion.